Organised by BBC and the Global Editors Network, this hack will gather teams from News organisations, academic and research institutions and members of the Global Editors Network.This #newsHACK theme is “The 2015 News Industry Accelerator” – What might we create together, to improve the NEWS industry for UK & global publishers? #newshack VIII a great gathering in East London of news orgs - who knew hacking was so noisy? Day one of NewsHACK has been quite a treat, and it is safe to say that all the teams are heading in a promising and interesting directions. It’s not very surprising, though, with so many big players and talented people in one room - but it’s always good news! We just wrapped up by going around the room to ask each team to informally tell everybody what they were up to, which problems they encountered, and how they felt about tomorrow. A common wish from the teams is to “have more time.” We’ll make a few phone calls tonight, but it might be a bit tight to get a TARDIS shipped here before tomorrow. 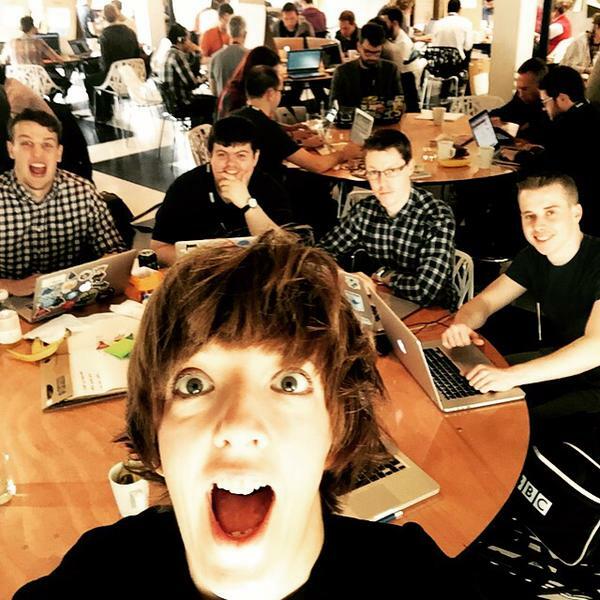 The teams will continue their hacking from 9am tomorrow and (hopefully!) finish mid-afternoon before the judges from both Global Editors Network and the BBC will pick their winners. As a reminder, the GEN winning team will be invited to Barcelona for the GEN Summit, and the team awarded by the BBC will be offered support (from the BBC and Goldsmiths university) for building an alpha version of their idea. 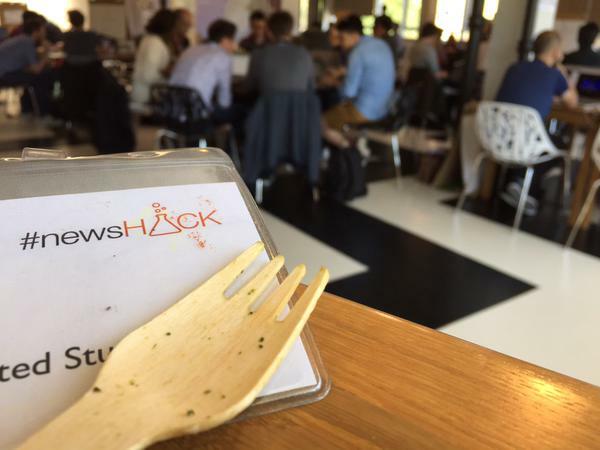 Hello and welcome to the second - and crucially last - day of NewsHACK VIII: The News Industry Accelerator! It is going to be a busy day for the 75 people gathering right now in the room, with coffee and croissants ; the most important bit of the schedule being the pitching session at 3pm! All the teams will have five minutes to present their idea, concept, prototype, or demo, and will be judged both by Global Editors Network (GEN), our partners for this event, and the BBC. 5- And as always… Surprise us! The pitching will begin in less than 5 minutes! 17 teams will go on stage to present and/or demo their ideas to our panel of judges from both the BBC and Global Editors Network. And here we are, it's pitching time! Our MC Robin Cramp stole Matt's mic and is in charge of taking us through all the projects! Geoff starts by showing us the sheer lot of stories currently on the BBC News website. What's the main problem a journalist faces? Moving the story along, finding a new angle, a new spin for a developing story. Oh, puns. But also, many sources of information, including social media. Say you want to write an article about Sepp Blatter, you'll be presented with a list of questions people asked Google and that will help you find your angle. All the sources and regions included in the BBC Juicer can also be interrogated to see what the media is talking about and mentioning in their articles, showing what's being talked about less (or way too much). Finally, charts are generated (instantly, without the need of a designer) to show the differences in coverages around the world. 2/17 - We've got Trinity Mirror next! Their project is about "perspectives." The public is interested in many issues, from health to education. Problem: with only one newspaper, people tend to have only one perspective on a given issues. The same thing happens to social media and following people like-minded. With Perspex, you can see the news according to three perspectives (left-wing, centre, right-wing) - between which the reader navigates by swiping right and left. The data comes from the Juicer, the Mirror's own platform, and social media. They demo'd a rather slick prototype app showing a list of issues, and showed us around the "EU Referendum" issue, with BBC as the default view, the Daily Express as right-wing, and the Guardian on the left. On their backlog is a different view for switching from regional to national coverage, as well as international and sports perspectives. Up judging for #newsHACK one again - some impressive work presented by BBC and Trinity Mirror teams already! 3/17 - It is The Sunday Times' turn on stage! So many tools are available on the internet, but how do you give access to journalists to all these fantastic tools scattered on the web and hard to use? Their Toolbox is a curated set of tools for journalists, encouraging collaboration between news organisations. Oh, and there's a demo of the website they created! A free text search will return a selected set of tools, up/down voted by users, with basic descriptions. But how do you know which one is good and has a documentation in my language or a live demo? Just flick the switches in the search form. Other organisations using the selected tool are also displayed. 4/17 - The Financial Times team is next, with Voxpopper, "the man in the street for a social crowd"
"The man in the street is the core of journalist, and the stories are better with real people - and when can you see what's happening." But we're stuck in the past with vox-pops and hacks sent in the street to ask people what they think about something they don't know about. VoxPopper is a widget included in an article or on Twitter, a call to action to the reader for sharing his or her opinion by sending back a video to the newsroom - with an Instagram backend. Journalists create their call-outs, and are then asked to curate the videos that will appear in groups... directly in the article itself! For them, news videos are more prevalent than ever, but news broadcasting is one way, there's no engagement. Everybody has something to say, but many are a bit lazy to do so, or the news might break when you're busy. And after a while, catching up is impossible. Their idea includes live chat, Twitter commentary from trusted sources using a hashtag, a neutral and effortless Like they call a "Pulse", immediate highlights for replay, and an aggregation of the data. They show the judges a live demo, with comment and pulses overlaid on the video playing, demonstrating how the editing is based on the highlights of the video. 6/17 - FIT Lab - Swansea university, that we saw earlier last month is Wales, is once again facing the judges and the audience! Aside from puns, they declare their love for the pub, drinking, and coffee shops. 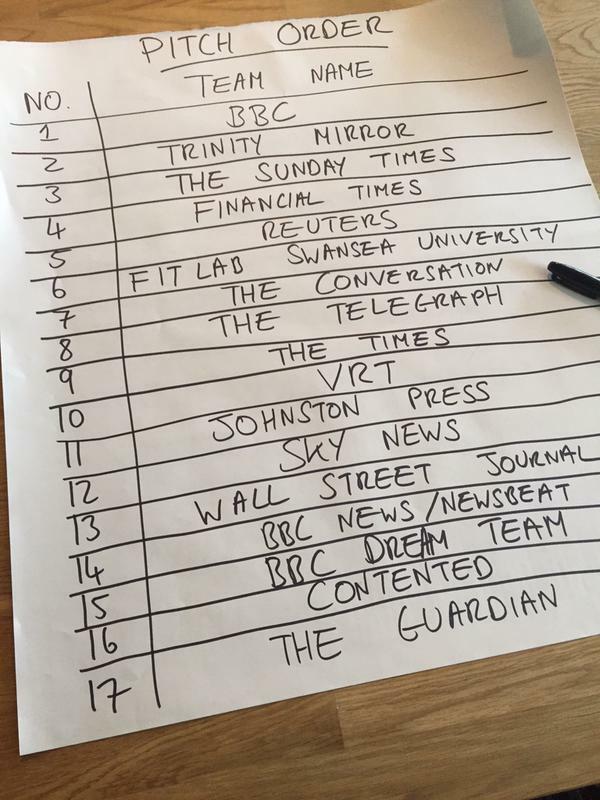 How can we utilise these places to project the news and promote discussion? With smart-watches, the news are displayed almost publicly, hopefully leading to a discussion and a constructive debate. Their persona, Emma, loves to discuss her passions on Twitter but she feels she can't be passionate about them - through current medium. With NewsWatch, news (from the Juicer) are picked by Emma in the morning... and later, she gets a notification on her wrist, that her friend sees, and starts a discussion about the topic. On the tech front, articles are coming from the Juicer, sent to an Android app and then to a Sony smartwatch thanks to Sony SmartConnect. An idea for the future: linking people with similar interests, so they can... let's say discuss the news. Pitching ideas for innovative media at #newsHACK in Shoreditch. International media, Swansea Uni & us! The joint team presents a meaningful link between BBC and The Conversation content, the BBC offering the breadth and The Conversation the depth. The pipeline is shown as a live demo by Rob (from News Labs). It is based on the tags presented on the Conversation website as a starting point. A bookmarklet would allow you to query related content from the BBC, and then presented on the right-hand side on the original article. About accuracy, Sylvia looked at the intersection of different bits, such as Politics, Economy, and Health. With a bit of graph theory, all the tags are matched against BBC content to provide highly related stories for better content. They also thought of a Nugget displaying both the BBC and The Conversation content, highly shareable... before our Hello Kitty bell rang! Rapid video annotation with semantic tags, helping form a data card timeline. An editor can watch a stream of videos and add annotation attached to a specific moment on timeline. They demo their idea with a PMQ extract, adding annotations on the fly, placed at specific moments on the video. Each annotation brings up a sidebar with background information about the annotation: biographies, related articles taken from the Juicer. On the user side of things, an app displays the background information as well. Of course, navigating between the highlights in the video is possible! This way, the information is not lost as soon as the moment is passed. Editing your piece in unison with narration and copy side by side: the copy and the audio recording are shown next to one another. The *experientist* can choose at any time how they want to consume the piece: through reading, or through their headphones, without missing anything. The product would be available on mobile and on smartwatches. And now for a live demo. The really interesting bit are the quotes, taken from the translator of Sepp Blatter when he announced his resignation - and they can be listened just by tapping on a word on the written piece. Downloading an offline version of the audio is available - and for longform pieces, you'd only download the parts of the piece you haven't read to save you data. Alexander and his magnificent beard from Belgium explains how we can't keep up with all the news published all the time. How can it be brought together? Yes, this is quite a lot of content. Thankfully, you can select continent or countries to filter the view of the news. Their experience is very visual and quite slick. Something they wished they'd did is auto-translating the headlines to make their idea even more global and browsable by all. 11/17, it's Johnston Press' slot! Oh, and there's a link on the screen... to a demo! The group of three really liked the idea of the Juicer and wanted to make it more visual. After logging in with Facebook, Newsvalise pulls in the user's interests and the Juicer sends related content to those. A fancy treemap shows the user related tags and concepts to what you're exploring, as well as some news articles. TV broadcasting has changed a lot since Sky started broadcasting 26 years ago. And now TV lives online afterwards, but searching videos is... quite a mess. Searching videos is useful for producers, video editors, researchers... and thus for the news. Vinion is a global search engine, real-time, automated video minion. For videos. Producers can pinpoint exactly a quote in the past, get the right length of shot for the end of their piece... and many more. George shoes us a live demo, based on full-text search, without the auto-transcription of the sound, but with some clever Final Cut Pro-like hovering of the video. He also mentions "for all the executives" that the business-model is viable and "will get you lots of money!" One of the hardest task of news publishers today is to reach people into their cars. But not with Audiocast, a mobile-only app using Factiva API and speech-synthesis to create a custom audio broadcast for each user, based on preferences. Eliot shows us a live demo on iPhone, and after some sound issues resolved by using the handheld microphone, the speech synthesis starts reading a news article. It keeps on playing the Factiva feed of news. Some to-dos: "a voice-control of the app would be awesome" for cars, auto-generated market reports, smart learning of what the user skips, and also *real* humans reading copy! They wanted to apply the "choose you own adventure" to news - as even news nerds don't have time to explore every news source. The user starts with a nine-squares screen, very specific or very broad. They're in fact curated at the moment, but they could be automated by associating content and tags, that they grab from Juicer already. When the user picks a square, he is presented with two stories. These two stories have something in common, a tag - and some content related to this tag is displayed as well. And so the user makes his way from one article to another. Along the way, you will only see new things, thanks to random calls to the Juicer content, and to social media related posts. Different modes are also available: Random, Popular, Friends, Pick a Timescale.